The European Robin (Erithacus rubecula), most commonly known in Anglophone Europe simply as the Robin, is a small insectivorous passerine bird that was formerly classed as a member of the thrush family (Turdidae), but is now considered to be an Old World flycatcher (Muscicapidae). 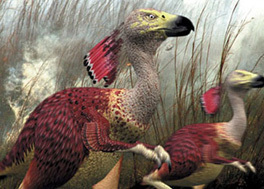 Around 12.5–14.0 cm (5.0–5.5 in) in length, the male and female are similar in coloration, with an orange breast and face lined with grey, brown upperparts and a whitish belly. It is found across Europe, east to Western Siberia and south to North Africa; it is sedentary in most of its range except the far north. The term Robin is also applied to some birds in other families with red or orange breasts. These include the American Robin (Turdus migratorius), which is a thrush, and the Australian red robins of the genus Petroica, members of a family whose relationships are unclear. The European Robin was one of the many species originally described by Linnaeus in his 18th century work, Systema Naturae, under the name of Motacilla rubecula. Its specific epithet rubecula is a diminutive derived from the Latin ruber 'red'. The genus Erithacus was created by French naturalist Georges Cuvier in 1800, giving the bird its current binomial name of E. rubecula. The distinctive orange breast of both sexes contributed to the European Robin's original name of redbreast (orange as the name of a color was unknown in English until the sixteenth century, by which time the fruit of that name had been introduced). In the fifteenth century, when it became popular to give human names to familiar species, the bird came to be known as Robin redbreast, which was eventually shortened to Robin. Other older English names for the bird include Ruddock and Robinet. In American literature of the late 19th century, this robin was frequently called the English Robin. The Frisian robyntsje or robynderke is similar to the English name, while Dutch Roodborstje and French Rouge-gorge both refer to the distinctively colored front. The Robin belongs to a group of mainly insectivorous birds that have been variously assigned to the thrushes or "flycatchers", depending on how these groups were perceived taxonomically. Eventually, the flycatcher-thrush assemblage was re-analysed and the genus Erithacus assigned to a group of thrush-like true flycatchers, the tribe Saxicolini, that also includes the nightingale and the Old World chats. Two Eastern Palearctic species are usually placed in the genus Erithacus, the Japanese Robin (E. akahige) and the Ryūkyū Robin (E. komadori), the latter being a restricted-range island species. Biogeography and mtDNA cytochrome b sequence data indicate that these might better be classified with some Far Eastern "nightingales", leaving only the European species in Erithacus. In its large continental Eurasian range, Robins vary somewhat, but do not form discrete populations that might be considered subspecies. Thus, Robin subspecies are mainly distinguished by forming resident populations on islands and in mountainous areas. The Robin found in the British Isles and most of western Europe, Erithacus rubecula melophilus, also occurs as a vagrant in adjacent regions. E. r. witherbyi from Northwestern Africa, Corsica, and Sardinia closely resembles melophilus but for a shorter wing length. The northeasternmost birds, large and fairly washed-out in color are E. r. tataricus. In the southeast of its range, E. r. valens of the Crimean Peninsula, E. r. caucasicus of the Caucasus and N Transcaucasia, and E. r. hyrcanus southeastwards into Iran are generally accepted as significantly distinct. On Madeira and the Azores, the local population has been described as E. r. microrhynchos, and although not distinct in morphology, its isolation seems to suggests the subspecies is valid. The most distinct birds are those of Gran Canaria (E. r. marionae) and Tenerife (E. r. superbus), which may be considered two distinct species or at least two different subspecies. It is readily distinguished by a white eye-ring, an intensely coloured breast, and a grey line that separates the orange-red from the brown colouration. Its belly is entirely white. While cytochrome b sequence data and vocalisations indicate that the Gran Canaria/Tenerife Robins are indeed very distinct and probably derived from colonisation by mainland birds some 2 million years ago. In addition, Gran Canaria and Tenerife birds are well distinct genetically between each other. Christian Dietzen, Hans-Hinrich Witt and Michael Wink published in 2003 in Avian Science a study called "The phylogeographic differentiation of the European robin Erithacus rubecula on the Canary Islands revealed by mitochondrial DNA sequence data and morphometrics: evidence for a new robin taxon on Gran Canaria?". In it they concluded that Gran Canaria's Robin diverged genetically from their European relatives as far back as 2.3 million years, while the Tenerife ones took half a million years to make this leap, 1.8 million years ago. The reason would be a different colonization of the Canaries by this bird, which arrived to the oldest island first (Gran Canaria) and subsequently passed to the neighboring island (Tenerife). A thorough comparison between marionae and superbus is pending to confirm that the first one is effectively a different subspecies. Initial results suggest that birds from Gran Canaria have wings about 10% shorter than those on Tenerife. The west Canary Islands populations are younger (Middle Pleistocene) and only beginning to diverge genetically. Robins from the western Canary Islands: El Hierro, La Palma and La Gomera (E. (r.) microrhynchus) are similar to the European (Erithacus rubecula). Finally, the Robins which can be found in Fuerteventura are the European ones, which is not surprising as the species does not breed neither in this island nor in the nearby Lanzarote, they are wintering exemplaries or just passing through during their long migrations between Africa and Europe. The larger American Robin (Turdus migratorius) is named for its similarity to the European Robin, but the two birds are not closely related. The similarity lies largely in the orange chest patch in both species. This American species was incorrectly shown "feathering its nest" in London in the film Mary Poppins, but it only occurs in the UK as a very rare vagrant. Some South and Middle American Turdus thrushes are also named as robins such as the Rufous-collared Robin. The Australian "robin redbreast", more correctly the Scarlet Robin (Petroica multicolor), is more closely related to the crows and jays than it is to the European Robin. It belongs to the family Petroicidae, commonly called "Australasian robins". The Red-billed Leiothrix (Leiothrix lutea) is sometimes named "Pekin Robin" by aviculturalists. Yet another group of Old World Flycatchers, this time from Africa and Asia is the genus Copsychus; its members are known as Magpie-robins, one of which, the Oriental Magpie Robin (C. saularis), is the national bird of Bangladesh. The adult European Robin is 12.5–14.0 cm (5.0–5.5 in) long and weighs 16–22 g (9/16–13/16 oz), with a wingspan of 20–22 cm (8–9 in). The male and female bear similar plumage; an orange breast and face (more strongly colored in the otherwise similar British subspecies E. r. mesophilus), lined by a bluish grey on the sides of the neck and chest. The upperparts are brownish, or olive-tinged in British birds, and the belly whitish, while the legs and feet are brown. The bill and eyes are black. Juveniles are a spotted brown and white in coloration, with patches of orange gradually appearing. The Robin has a fluting, warbling song in the breeding season, when they often sing into the evening, and sometimes into the night, leading some to confuse them with the Nightingale (Luscinia megarhynchos). Nocturnal singing in urban Robins occurs in places that are noisy during the day, suggesting that they sing at night because it is quieter, and their message can propagate through the environment more clearly. Daytime noise outperformed night-time light pollution as a predictor of nocturnal singing activity in urban robins in Sheffield, England. Both the male and female sing during the winter, when they hold separate territories, the song then sounding more plaintive than the summer version. The female Robin moves a short distance from the summer nesting territory to a nearby area that is more suitable for winter feeding. The male Robin keeps the same territory throughout the year. The Robin occurs in Eurasia east to Western Siberia, south to Algeria and on the Atlantic islands as far west as the Azores and Madeira. It is not found in Iceland. In the south east, it reaches the Caucasus range. British Robins are largely resident but a small minority, usually female, migrate to southern Europe during winter, a few as far as Spain. Scandinavian and Russian Robins migrate to Britain and western Europe to escape the harsher winters. These migrants can be recognized by the grayer tone of the upper parts of their bodies and duller orange breast. The European Robin prefers spruce woods in northern Europe, contrasting with its preference for parks and gardens in the British Isles. Attempts to introduce the European Robin into Australia and New Zealand in the latter part of the 19th century were unsuccessful. Birds were released around Melbourne, Auckland, Christchurch, Wellington and Dunedin by various local Acclimatisation societies, with none becoming established. There was a similar outcome in North America as birds failed to establish after being released in Long Island, New York in 1852, Oregon in 1889-92, and the Saanich Peninsula in British Columbia in 1908-10. The Robin is diurnal, although has been reported to be active hunting insects on moonlit nights or near artificial light at night. Well known to British and Irish gardeners, it is relatively unafraid of people and likes to come close when anyone is digging the soil, in order to look out for earthworms and other food freshly turned up. Indeed, the robin is considered to be a gardener's friend and for various folklore reasons the robin would never be harmed. In continental Europe on the other hand, robins were hunted and killed as with most other small birds, and are more wary. Robins also approach large wild animals, such as wild boar and other animals which disturb the ground, to look for any food that might be brought to the surface. In autumn and winter, robins will supplement their usual diet of terrestrial invertebrates, such as spiders, worms and insects, with berries and fruit. They will also eat seed mixtures placed on bird-tables. Male Robins are noted for their highly aggressive territorial behaviour. They will attack other males that stray into their territories, and have been observed attacking other small birds without apparent provocation. Such attacks sometimes lead to fatalities, accounting for up to 10% of adult Robin deaths in some areas. Because of high mortality in the first year of life, a Robin has an average life expectancy of 1.1 years; however, once past its first year it can expect to live longer and one Robin has been recorded as reaching 12 years of age. A spell of very low temperatures in winter may also result in significant mortality. This species is parasitized by the moorhen flea, Dasypsyllus gallinulae. Breeding:Robins may choose a wide variety of sites for building a nest, in fact anything which can offer some form of depression or hole may be considered. As well as the usual crevices, or sheltered banks, odder objects include pieces of machinery, barbecues, bicycle handlebars, bristles on upturned brooms, discarded kettles, watering cans, flower pots and even hats. The nest is composed of moss, leaves and grass, with finer grass, hair and feathers for lining. Two or three clutches of five or six eggs are laid throughout the breeding season, which commences in March in Britain and Ireland. The eggs are a cream, buff or white speckled or blotched with reddish-brown color, often more heavily so at the larger end. When juvenile birds fly from the nests they are mottled brown in color all over. After two to three months out of the nest, the juvenile bird grows some orange feathers under its chin and over a similar period this patch gradually extends to complete the adult appearance. The avian magnetic compass of the Robin has been extensively researched and uses Vision-Based Magnetoreception, in which the Robin's ability to sense the magnetic field of the earth for navigation is affected by the light entering the bird's eye. The physical mechanism of the Robin's magnetic sense is not fully understood, but may involve quantum entanglement of electron spins. The robin features prominently in British folklore, and that of northwestern France, but much less so in other parts of Europe. It was held to be a storm-cloud bird and sacred to Thor, the god of thunder, in Norse mythology. More recently, it has become strongly associated with Christmas, taking a starring role on many Christmas cards since the mid 19th century. The Robin has also appeared on many Christmas postage stamps. An old British folk tale seeks to explain the Robin's distinctive breast. Legend has it that when Jesus was dying on the cross, the Robin, then simply brown in color, flew to his side and sang into his ear in order to comfort him in his pain. The blood from his wounds stained the Robin's breast, and thereafter all Robins got the mark of Christ's blood upon them. An alternative legend has it that its breast was scorched fetching water for souls in Purgatory. The association with Christmas, however, more probably arises from the fact that postmen in Victorian Britain wore red uniforms and were nicknamed "Robin"; the Robin featured on the Christmas card is an emblem of the postman delivering the card. Robins also feature in the traditional children's tale, Babes in the Wood; the birds cover the dead bodies of the children. Another view is that as winter drew, the swallow, the cuckoo and the martin flew south whilst the English Robin remained to celebrate Christmas. In the 1960s, in a vote publicized by The Times newspaper, the Robin was adopted as the unofficial national bird of the UK. The Robin was then used as a symbol of a Bird Protection Society. Several English and Welsh sports organizations are nicknamed "The Robins". These include the professional football (soccer) clubs Bristol City, Swindon Town, Cheltenham Town (whose home colors are red) and, traditionally, Wrexham FC, as well as the English Rugby League team Hull Kingston Rovers (whose home colors are white with a red band). A small bird is an unusual choice, though it is thought to symbolize agility in darting around the field. [ Moreover, the Swindon Robins is the full name of the local Speedway promotion.